Last year Robert Hannaford had tongue cancer. This self-portrait was one of the first paintings he did during his recovery at the end of chemotherapy and radiotherapy treatment. Painting again after the enforced break was ‘a joy, really wonderful … It seemed like I had endless time. I did a series of drawings and spent a lot of time on the painting, which was done over several months’. Born in 1944, Hannaford lives and works as a full-time artist in Riverton, South Australia. 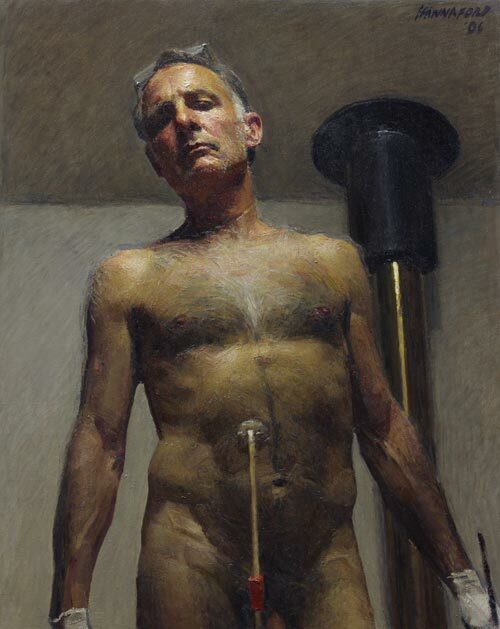 Acclaimed for his portraits, he also paints landscapes and nudes and is a sculptor. His sculpture of Sir Donald Bradman stands outside the Adelaide Oval. He won the Doug Moran Portrait Prize in 1990 and the inaugural Fleurieu Landscape Prize in 1998. He has been commissioned to paint many well-known public figures including former governor-general Sir William Deane, former prime minister Paul Keating, Dame Joan Sutherland and Sir Donald Bradman. In 2001 he was awarded his most challenging commission: to paint the centenary of federation commemorative sitting of the Commonwealth Parliament held in Melbourne. The vast composition took over a year to complete. Hannaford has been an Archibald finalist on 16 previous occasions, winning the People’s Choice three times.